Hey gang, many of you have Macs so I'll share this with you. I know Kris recently had his iPad stolen and most of you already know about Apple's Find my iPhone which have allow iPad owners to recover their devices. I have used Undercover for Mac since I bought my Mac in 2011. It works like Find my IPhone, but it is much better. A stolen iPad may never go online, but it is highly unlikely that a stolen Mac would be used exclusively offline. This fact increases your chance of recovery. When I installed it back in 2011, I tested it and reported it stolen. I was able to track it, capture photos and screen shots. It works as advertised. I literally forget about it until they send me the monthly reminder that my Mac is doing well. It is sort of like my On-Star monthly diagnostics email; except I don't pay monthly to protect my Mac against being lost forever if stolen. Undercover transmits location information from the stolen Mac. This information includes the coordinates from wireless location tracking, and the internal and external IP addresses, enabling the police to accurately trace the Mac's physical location, in collaboration with the Internet Service Provider. You have the ability to capture photos from the camera and even capture screenshots of whatever the bad guy is viewing on the screen. If your Mac has a built-in or external camera, Undercover will transmit pictures of the thief and his surroundings every 8 minutes, making it even easier to identify the current user. Undercover was the world's first theft-recovery software to send screenshots of your stolen Mac at regular intervals. These screenshots will sooner or later reveal the thief's identity (e.g. when chatting, reading and writing emails,...) making it much easier to work with law enforcement in order to recover your Mac. "According to a recent FBI report, 97% of all stolen computers are never recovered. Many people we know have had their Macs stolen, often in 'safe' situations. That's why we developed Undercover: a unique theft-recovery application designed from the ground up for Mac OS X. While I hadn't had my iPad stolen, this is a very affordable insurance that you have a chance to get it back if it is stolen. " A single license is $49 and a five Mac package is $59. 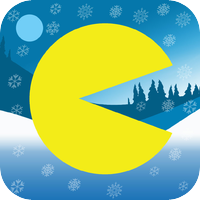 Just a quick heads-up: Pac-Man is this week's App of the Week and it's now available to download for free. Who can forget the countless hours and quarters spent avoiding pesky ghosts while chompinf on pellets and gobbling up fruit for bonus points? In addition to the Classic maze, there are eight new mazes to explore, each featuring ghost-free Bonus rounds. Try them out for free and purchase them to play forever! Did you make working out a new year resolution? Apple assumed you did and wants to give you the "7 Minute Workout Challenge" app for free to get you started. The app is normally $1.99. It is free, but not in the AppStore. If you search for it in the AppStore, it will still ahi up as $1.99. You have to redeem the code inside the Apple Store and click on the "Jump into the New Year" link to redeem the code. So if you are interested, download the Apple Store app and grab it before Feb 20 or so. Here are the iOS 7 changes I have found for the iPhone, but most are the same on the iPad and the iPod Touch too. With Apple claiming there are 200+ changes, these are merely a drop in the bucket. Find my IPhone - despite the name, it works for iPad, iPod Touch and iPhones. As an iCloud user, part of your upgrade includes new features built into Find My iPhone that make it harder for anyone else to use or sell your device if it is ever lost or stolen. Lock screen - removed the grey box around time and slide to unlock. Background picture is more prominent and uses the gyroscope inside to make the picture appear to move behind the text. (This same feature works with the picture behind the icons and folders on the home screens). The charging battery graphic is different as well and only appears for a few seconds before simply displaying the upper right corner battery icon in green. Dynamic wallpaper - In addition to your own photos or stock photos being used as wallpaper, the user can use dynamic or constantly changing wallpaper. Apple included 7 simple wallpapers that have constantly moving circles that can be used on the lock screen or home screen. Since you can't read movement, you can watch the video to see it in action. Control panel - quick access to toggles for Bluetooth, wifi, airplane mode, do not disturb and more. The icons and controls are as follows: airplane mode toggle, wifi toggle, Bluetooth toggle, Do Not Disturb mode toggle, Screen rotation lock, brightness level slider, music or media control area, volume level slider, AirDrop area, Airplay or Audio output selector, flashlight, clock (timer, stopwatch and alarm) icon, calculator app shortcut and a camera app shortcut. The only thing missing is a link to the Settings app while these toggles and controls reduces the need to open the Settings app, it does not eliminate it. It would be nice to be able to launch it here versus searching or hunting for the Settings app. Control Panel can be pulled up by swiping up from the bottom of the phone (starting below the screen) from the lock screen, home screen and within all apps. The control panel can be turned off for either the lock screen or for all apps from within the Settings app. Multitask area - double tapping the home button will produce a list of open apps with both a preview window and an app icon. You can tap on the icon or preview area to open the associated app. You can swipe the preview screens left or right to find the app you want to open or close. Swipe the preview screen up off the top of the screen to close the app. You can swipe two at a time off the screen. Where have we seen this used before? WebOS! Palm used this exact technique first on is Palm Pre smartphone and again on its WebOS tablet before Hewlett Packard (HP) bought Palm and its gadgets only to kill all of them off. Swipe Gesture - the iPad has had swipe gesture for a while now, but not for the iPhone. Now the iPhone can enjoy some swipe love at least for going back to the previous page. When you are in reading the body of a text message or email message, swipe from the left edge toward the right to return to the prior screen. The message slides off the screen to the right to reveal the list of messages. This back swipe works for many apps including Settings, Safari, Photos, Contacts, AppStore and more. Camera - instead of fishing for the tiny toggle for picture or video, the main viewing area can be swiped left or right to switch between video, photo, square and pano (panorama) capture modes. A small selection of filters have been included to allow uses to change the color of the captured images made with the photo and square options. Spotlight - System search is now accessed by pulling down on a blank area of the home screen instead of pressing the home button from the first home screen. It can be accessed from any home screen instead of only the first screen. In the Settings, the user can excluded apps from the list of results or determine which order the items will display. Finally, the top item for the text that you typed now shows the directory where the app resides. AppStore - The AppStore has a new tab that shows you apps that use data from around the location you are presently at. Additionally, there is now an app wish list. When viewing an app in the AppStore that you don't own or previously downloaded, you can tap the new square share button and tap the "Add to Wish list" option. The list is now populated with the app: the list is represented by a row of lines at the top right corner. Within the AppStore app, you can now see the recently updated apps and read the notes for the last update. You see the date of the update, the app list, version of apps and description. Downloading apps status - the icon will show a moving pie graphic that depicts the status of the app download. Notice the Hulu plus icon in the home screen and the download status of an app located within a folder (Favs on the dock). Unlimited Folders - folder can now hold an unlimited number of apps: no more "Games 1", "Games 2", etc. I have over 90 games in the above folder. Note that there page indicator dots at the bottom of the folder. Each page in the folder can contain 9 apps. Folder background color will change based on the color of the wallpaper you have selected for the home screens. Notice above that the folder has a brown or beige background color while the folders below have a blue background because of the color of the wallpaper. Email - swipe to left to delete or archive messages. Messages - forwarding messages is handled differently. Press and hold on a message bubble to show the copy and more buttons. Press the more option to display all message bubbles with the one you press and held selected. You can delete or forward this message (or multiple messages by selecting more messages) by pressing the "trash can" at the lower left or the "forward arrow" at lower right corner. Within the message, you can now tap the "Contact" button to present icons to call, FaceTime or view contact information. In the past, one would have to find the number to call from the contact information. Block Callers - from an individual contact, in the recent caller list or in the Settings app (under phone section) , a user can block a caller from sending the user a text message, email and of course from calling the user via the phone or FaceTime. The blocked user is unaware that a message or email is not sent, but they will receive a recorded message explaining that their call cannot be made to the intended party. The message is unique enough that a caller can come to know that the user has blocked their call. Callers that don't exist in your Contacts must be blocked from the recent call list in the Phone app; these numbers cannot be manually added in the Settings app. You can block from within the call log's recently called list. You can block from within a contact. You can manage the blocked callers from the Settings app's Phone section. You can add existing contacts to the block list from the Settings app. You can also unblock contacts here. Safari - forward and backward buttons have been added to navigate through web pages. It now sports an integrated URL address and search into one area instead if two separate fields. A newer preview pane view for open web sites is now available on the iPhone, instead of the tabs found on the iPad. The old pane placed the preview screens vertically which allowed the user to see only one pane at a time. The new view stacks the preview windows horizontally, which allows more panes to be viewed at once. You also can see the open pages from your other devices, plus open a private session for browsing. Music - iTunes Radio is now available in the music app. Similar to Pandora, iTunes Music allows the user to create stations based on Genre, artist or song title. The service is free. It has audio and visual ads. Photos - photos are now sorted my moments based on location and/or the blocks of time that pictures are taken. Instead of a continuos or endless rows of pictures in a straight column, moments breaks the pictures into smaller segments or groups of pictures that makes it easier to identify an area where a picture can be located for viewing or sharing. Maps - the old maps used to show alternative routes labelled as Route 1, Route 2, and Route 3. Now they are labelled with the time that it will take you to reach the destination, such as 35 min, 37 min and 38 min. This allows you to determine if an alternative route is better right always instead of showing this information after you select a route like before. The green street signs are gone and it even changes the graphics based on the time of day (I.e. night mode). It still prohibits you to pan to a spot on the route while in direction mode. You still can only see the current segment you are driving or an overview of the entire route (Come on Apple). What good would a new phone or newer IOS version be if it sounded like the old phone and old iOS? Apple has added some newer sounds to make your new phone or new iOS be heard above the crowd. Here are just a sample of the available new sounds. Siri has made some changes too. The female and make voice is more human than robotic. The biggest change is that iOS 7's Siri no longer use Google as the search engine for web searches; it uses Bing. Additionally when it does the default Bing search, it shows the results in the Siri screen and not in a browser. So if you ask Siri to "Search the web", you will get search results from Bing. You have scroll all the way to the bottom to see that the results are from Bing. You cannot change this search relationship at all, but if you are like me and prefer Google search over Bing, you can say "Google..." before your search query to get Google results. When the results are displayed, they done so inside a browser instead of the Siri interface. In iOS 6, Apple allow is to use Siri to open apps. With iOS 7, you can finally toggle wifi, airplane mode, Bluetooth by asking Siri to turn them on or off. Here is "Do not Disurb" being turned off. Here is Bluetooth being turned off. How about playing music on iTunes Radio? Siri takes care of that too. Even pausing it by voice as well. Did I miss any iOS 7 features you have found or that you use? One of my favorite iOS Jailbroken tweaks is Graviboard. Graviboard is a tweak that adds gravity-like behavior to the iOS Homescreen on your iPod Touch, iPhone and iPad. I received an email at 4:13AM this morning from Conrad Kramer, the developer of Graviboard (Kramer Software Productions), that he submitted the iOS 6 supported version to Cydia. Earlier this afternoon, it showed up in Cydia. I have been waiting for this update since iOS 6 came out and had inquired with Conrad back on Mar 16, 2013 about supporting the newest operating system from Apple. Whenever you return to the Homescreen, the icons and folders will react based on the settings that you have set up for Graviboard. You can drag an icon around on the screen to move the icon around the screen. The behavior of the icons can be changed within Graviboard area within the normal iOS Settings app. It is a very nice tweak that just adds a little fun to the iOS Homescreen. If you have a few other tweaks installed on your iOS device, I recommend you wait a couple of days for Conrad or other developers to make the tweaks work together. I also use Gridlock and had to disable it (through SBsetting - and people keep saying they can get away without using SBsettings) to have Graviboard work without rebooting the device. Additionally it works, but with some folders did not move until I disabled the Springtomize settings (within the Springtomize app); Conrad or the developer of Springtomize will have to update their products for it to work properly. In a couple of hour or days, Graviboard will be working nicely with the other popular Cydia Tweaks. Update: Conrad did release the update within a few hours and now the tweak works just as advertised. This tweak always get a response from people that see it, "Wow, how do you make your icons explode like that when you turn your phone on?" is the question I get the most. Velox, one of the most anticipated Cydia tweaks of recent memory, is now available in the Cydia store (Jailbroken iOS devices only) for $1.99. So what does Velox do? Velox brings a new way to interact with your iOS device by allowing you to swipe on certain apps to view notifications, obtain information or to perform certain actions without opening the app. How it interacts with each app is different; with most apps having just displaying notifications while other provide interaction with the app. Velox opens what its developer calls "a folder". You can interact with the information displayed within folder. The most obvious question is why do I need it? Or why not just open the app itself and do the same actions? Good questions! The quick answer is that using Velox to display the content does so without requiring the app to open and more importantly does NOT stay open in the background long after you obtain the information or action you sought. Normally when you open an app in iOS, the app remains open until you double press the Home button, press and hold the icon to get it in wiggle mode before displaying the "X" so that you can tap the "X" to close the app. You have to repeat the "X" tapping to close each app separately. This is crazy. If you could perform the same action and not keep app running, would that be wonderful? For some of us, the answer is yes. Velox does this; well for some actions. So what types of actions are available in a folder view? iMessage: View the entire SMS or iMessage messages (not summaries), remove the messages from the folder, click to reply to any message shown or compose a new message. The developer say these are all done at the Springboard (the place where the app icons display), but this is true for everything mentioned except replying to a message. The developer must have missed this, because when you tap a message to reply; the iMessages app launches instead of the popover dialog box that appears when a new message is composed from the folder view. I am sure the developer will fix this soon. Photo: Presents icons that allow you to send the very last picture in your camera roll to your Twitter or Facebook account without selecting the picture. You can also attach it to an email or copy it to the clipboard to pasted into any app that supports pasting. Mail: Swipe up or down to display a list of recent mail messages. The notification can be swiped to the left to clear the notification. It can be swiped to the right to reply to the message. Again, the reply requires the Mail app to launch, but at least it is reply mode and ready for you to draft your reply. The Gmail mail app looks similar in appearance, but the reply to email function is not available. This is the normal behavior for any "unsupported" app. Again, the app has to support notifications and they have to be turned on in the Setting app first. Notes: Produces a ready to write "New Note" popup screen that allows to type and then save the note. Phone: Displays a list of recent calls with a phone icon and a "three dot icon" when links to the SMS/iMessage for that caller. Tapping the three dots opens the iMessaging app. Tapping the phone icon does nothing. The developer advertises that it should call the person on the list, but it does not (yet); another oversight on the developers part. Contacts: Provides a list of contacts with a search box and alphabet slider to allow you find your contacts. Music (or iPod): Swipe to pull up quick access to music controls: Play\Pause; Previous song and Next song. You can also launch the Music app from here if you like. A slider exists to allow you to skip to any part of the music. Album art is shown with the artist, song and album name. Weather: Swipe up or down to see weather. This also exists in the notifications area, so this is not much of a convenience, except for not having to reach so high up on the screen. Reminders: Shows a list of reminders, but also shows reminders that are marked as completed. At least it shows an indicator that the reminders are active (dot) or completed (check mark). Settings: Provides icons for quickly toggling settings like WiFi, Bluetooth, Location, Airplane mode, Mute, Rotation Locking, etc. The main thing to understand about this tweak is that you have to have notification turned on within the Settings app to allow this tweak to do its thing. If you are like me and have most notification turned off, then you will have to turn some of them on to benefit from this tweak. This tweak may not play well with some of your other tweaks, so be cautious. The developer is aware of some of the issues prior to releasing the app. The fix may require both tweak developers to communicate and take action, so it may be a matter of hours, days, months or later for some of them to be resolved; so be advised and/or patient. The developer did not properly beta test the product before launching it. The developer made the tweak available only to a very small list of people instead of a larger test group. Many of these issues would have been found had the developer done its due diligence. Some have gone so far to say that this is the "best tweak ever". I would not go so far, even if it hadn't had the issues that it was released with. It is just a matte of preference; I would put a few apps or tweaks way above this one on the list of best Cydia tweaks: Springtomize, SBSettings, and FolderEnhancer (just to name a few). This tweak is definitively worth the $1.99, but I would say wait a few days to a week to get it unless you are ready to have your iOS device be unstable. This would be my advice for any new Cydia tweak or Cydia tweak; especially one that has not have a valid beta test period. Update 05/06/13: The troubles I described above are mainly due to the FolderEnhancer tweak compatibility that both developers are aware of. Watch the video below that shows everything working as advertised (except for the camera icon). Not compatible with iPad yet, this is being worked on. Velox brings a new way to interact with your iDevice's apps to view notifications and more. With a single swipe up or down on an app you will invoke a folder containing new notifications pertaining to the app right on your home screen. Within the folder tap to view the notification, swipe to the left to dismiss that notification or pull down and you clear them all. Velox goes a step further with some native apps. * iMessage. Swipe up or down, tap on "Compose new message" and you can send a "quick message". You can also reply to a message you received, right from the springboard. * Mail. Invoke Velox, see all your unread mail in a folder. Swipe left to dismiss that email but with a swipe to the right send a "quick reply" or tap compose new to send off a new email to tell your friends how awesome Velox is. * Notes. Velox swipe, and you can write a new note on your home screen. * Phone. See a list of missed calls and text or call them right back from the folder. * Calendar. Have a quick look at your upcoming events, tap on an event to see the details for that event. * Weather. Do "the Velox slide" and you're looking at your location's weather for the day. Just a swipe to the left or right and you can filter though all of your saved locations. * Settings. You'll have instant access to some of the main settings for your iDevice: Bluetooth, WiFi, Airplane Mode, Rotation Lock, Respring, Data, Mute, Location Services, DND and Flash. * iPod. Quick swipe and you can start your tunes rocking, skip back and forth, pause and scrub through your tracks right from your home screen. Don't forget a tap on the album art and drop right inside your music collection. Also! works with any app that plays music, like Spotify, TuneIn etc. * Safari. Invoke Velox and you can browse to any website that you need to from the home screen. Please don't be an "oyk," pay for it. The devs and designer need to buy their energy drinks and sweets to bring you the updates that we have started to work on. Velox is compatible with these: Auxo, Zephyr, Abstergo, infinifolders, BiteSMS, Springtomize 2 and many others. Currently we know that the following are NOT compatible with Velox: SBRotator or FolderCloser. We are working on getting Velox to play nice with them. Developed by Benno & Daniel designed by Steve making up Team Apex.